Like any good quarterback, Philip Rivers dropped back and surveyed the field. Only this time, he wasn’t searching downfield for an open receiver. He was looking beyond the confines of the stadiums where he makes his living as a professional football player. In the distance, he saw children in the community who needed help, a home, and a family to call their own. As he zoomed in for a closer look, he saw hope in the faces of kids who had been bounced from house to house and were separated from siblings, never knowing the love and stability of a real home. Unable to pass up the opportunity to help vulnerable children, blessed with talents that make him one of the National Football League’s top quarterbacks, and motivated by strong pro-life convictions, Philip and his wife, Tiffany, established the Rivers of Hope Foundation. It assists foster children in San Diego County, where he stars for the Chargers football team. In less than three years, many graces have flowed through Rivers of Hope. Today, hundreds of foster kids in that county and beyond are benefiting from the generosity of Philip and Tiffany Rivers. 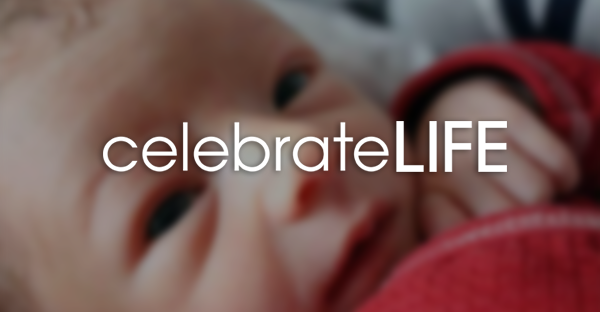 Their charity and deep faith provide witness that the culture of life is about protecting the born as well as the preborn. After his stellar performance on the North Carolina State University football team, the Chargers selected Philip in the first round of the 2004 NFL draft. By the end of the decade, he had led his team to four division (AFC West) titles and three playoff victories. On and off the field, Philip’s passion for achievement runs deep, and he wanted to use his celebrity status and financial resources to establish an organization focused on children. Two defining moments led Philip and Tiffany to founding Rivers of Hope. In 2009, during a photo shoot for an adoption calendar given away at Chargers games, Philip witnessed the resilient spirit of children separated from a biological relative, as well as the insecurity that comes from not having roots. He shared his impressions with Tiffany. Additional confirmation of their calling came while the family was driving home from a trip to Disneyland. “God kind of revealed it to us,” Philip recalled. “We both knew we wanted to do something with children, and I’m very pro-life. We thought, ‘What about the kids who are here, who aren’t given the love and care that they deserve?’ At that point, we still didn’t realize the need and how many foster kids there were in San Diego County.” They soon learned the surprising truth that there are more than 500,000 children in foster care throughout the US and nearly 130,000 waiting to be adopted. Rivers of Hope was instituted as a public foundation in 2010, with a twofold mission. Its primary purpose is to find “forever families” for children up to age 12 who are unwanted, abandoned, and often stuck in the foster care system. At any given time, 1,000 or more children are waiting to be adopted in San Diego County alone. The Heart Gallery, a photographic exhibit on Rivers of Hope’s website, displays pictures and stories of foster children awaiting adoption, and has proven to be an effective tool for permanent home placement. The foundation funds the display of these photos at events, and on signs and banners in various locations in San Diego County. Philip finds nothing more gratifying than visiting the Heart Gallery and seeing that a family is interested in adopting a child. “When it says ‘family found’ or ‘potentially matched’ at the bottom of their picture, that’s awesome,” he commented. Rivers of Hope has also established several programs to ensure that children who remain in foster care aren’t forgotten. The Birthday Club provides gift certificates for children whose special day might have gone unrecognized. The Something Special Fund makes money available to foster children for special activities, such as playing a musical instrument, participating in a sport, going to camp, or paying a college application fee. Rivers of Hope’s newest project is Bridges to Success, a mentoring program for young adults transitioning out of the foster care system after they reach 18 years of age. Bridges to Success teaches practical skills required for tasks such as applying for college, interviewing for jobs, and managing money. For example, Rivers of Hope assists Voices for Children, which advocates for the best interests of foster children who have become dependents of the courts, and Angels Foster Family Network,which places babies and toddlers with stable, loving, carefully screened and trained foster parents for up to two years. The foundation also supports Home Start, a local nonprofit agency that provides a maternity shelter program for pregnant or parenting young women who are homeless or at risk of homelessness. And the Rivers of Hope website prominently displays a toll-free number and website address (www.PregnantandScared.me) “for assistance or information on an unplanned or unwanted pregnancy.” They lead to a local pro-life organization and medical practice, Culture of Life Family Services, dedicated to assisting women facing crisis pregnancies. Philip serves on its advisory board. Since 2010, Rivers of Hope has pledged or donated over $1 million to these causes. Philip also has a private foundation that gives emergency grants of up to $5,000 for an adoption, and supports religious groups and other charities. In January 2012, Philip was named one of three finalists for the NFL’s esteemed Walter Payton Man of the Year Award, which is given to NFL players for their community service and playing excellence. Doug Bean is a writer/editor who resides in Westerville, Ohio, with his wife, Janice, and their six children. To learn more about the Rivers of Hope Foundation, visit PhilipRivers.com or RiversofHopeFoundation.com. 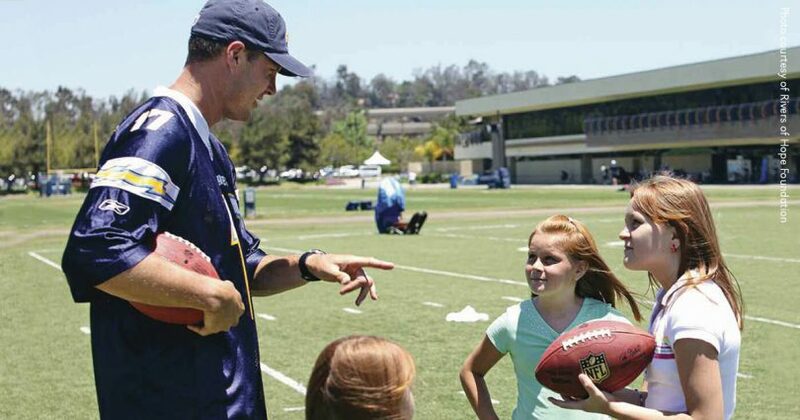 Avid football fans know Philip Rivers as the fiery leader of the San Diego Chargers football team. They’ve witnessed what he can do on the field, but what many fans don’t know is that he’s also a devoted husband and father of six, and a man with a huge, childlike heart. Philip was born on December 8, 1981 (the Solemnity of the Immaculate Conception, a “coincidence” he’s well aware of) in Decatur, Alabama, where his father was a high school coach. Philip credits his devotion to the Catholic faith to his parents, who instilled in him strong moral principles, as well as the importance of receiving the sacraments and never missing Sunday Mass. He and his wife, Tiffany, were married after their first year of college at North Carolina State University. Tiffany is a convert to the Catholic Church, and made her First Communion on the day before their wedding. Philip isn’t shy when it comes to expressing his faith and values. He’s proudly Catholic. He’s passionately pro-life. And he’s willing to speak about the Church’s teaching on openness to life, which is the cornerstone of his marriage. Despite his hectic schedule, Philip makes time for his children. “Ultimately, keeping the priorities of faith, family, and football is what keeps everything grounded for me,” he explained. For the culture of life and in the game of football, Philip Rivers is truly a champion.